750 MA, lightweight, compact trickle charger with a brain. 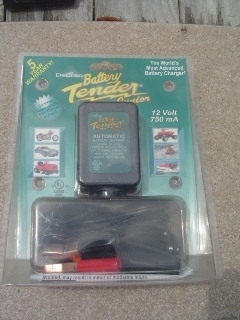 Fully automatic two stage battery charger perfect for all lead acid, sealed maintenance free and gel cell batteries. After reaching peak 14.4 VDC charge automatically switches to 13.2 float voltage. If voltage is under 12.6 VDC charging resumes at 14.4 VDC. Two color LED indicates state of charge. Reverse polarity protected & spark proof 12 ft output cord.